I painted this study yesterday late afternoon. It certainly was breathtaking to be looking down upon the Imnaha River like this. This viewpoint on Grizzly Ridge is more than 3000 feet above the canyon floor. The temperature was in the 90's on the floor and about 70 degrees on the ridge. 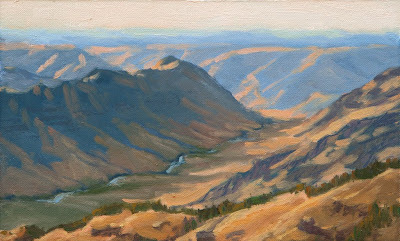 This is the view looking north from Hells Canyon through Imnaha Canyon toward Imnaha and the Big Sheep Canyon. The ridge on the other side of the canyon is called the Sheep Creek Divide. The road up here is a narrow single lane gravel road with a few turnouts and lots of washboards on the steeper sections. The drop offs on the side of the road are impressive; if a car went off the road it may never be found in some places. I would also like to paint the view looking south if I can get back up this way again soon. Study 10x6", Oil on Linen.